I am not comfortable that a state agency here in Ireland actively encourages the use of Glyphosate, the active ingredient in Roundup. This was mailed out to their client base in the last month. In 2009 Scientific America published the results of findings showing that Roundup’s inert ingredients can kill human cells, particularly embryonic, placental and umbilical cord cells. From Wikipedia: Glyphosate (N-(phosphonomethyl)glycine) is a broad-spectrum systemic herbicide used to kill weeds, especially annual broadleaf weeds and grasses known to compete with commercial crops grown around the globe. It was discovered to be a herbicide by Monsanto chemist John E. Franz in 1970. Monsanto brought it to market in the 1970s under the trade name “Roundup”, and Monsanto’s last commercially relevant United States patent expired in 2000. Teagasc loves roundup (agent orange? 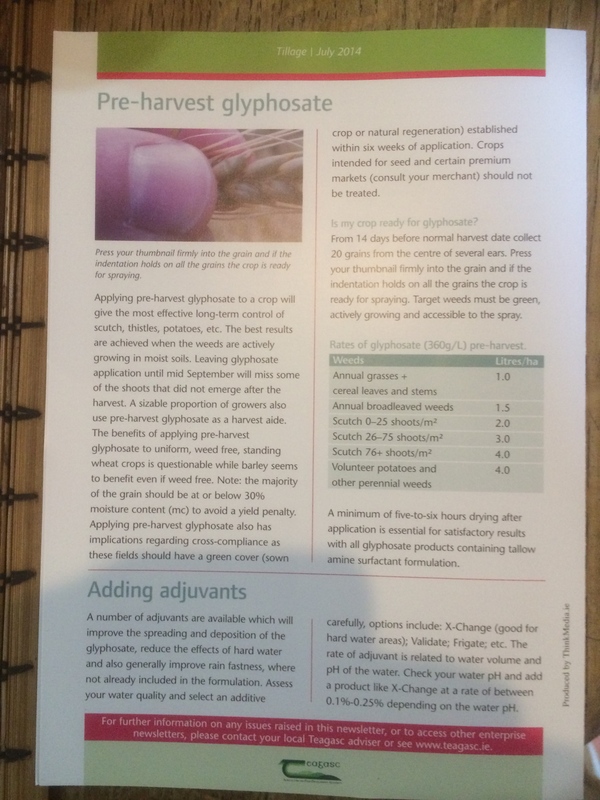 ), I came across their leaflet describing the production of biomass willow a few years ago and could not believe how many applications of roundup they deemed necessary for a native species that grows so readily from cuttings stuck directly in unprepared soil without any suppression of established vegetation (weeds?). The certainty that roundup is not a good idea for us humans has been around for a long time but so many people rely on its miraculous properties to keep nature in control without the necessary hard physical work I guess they do not want to know. I have a neighbour here in Leitrim whose only notion of gardening is spraying roundup on his 1 acre site and the portion of lane alongside it every few months, it looks like a post-nuclear landscape but some lovely weeds flower in the middle still. One’s relationship with nature in the form of weeds and slugs (here) or perhaps rabbits (in the south-east) is an interesting subject I think, I care to believe that there are nicer, more holistic paths to try and negotiate, I’m sure you do too. I stopped reading anything Teagasc related a few years ago when it became clear that they were about big ag and not about producing good food. This leaflet is further evidence of that. It is quite unsettling that this is coming from a state agency, but many similar agencies worldwide are focused on how to feed our ever-expanding population rather than on nourishing them. I think we’re at a peak of life-expectancy – due to poor nutrition people people are dying younger. Hopefully the focus will soon move to quality over quantity.